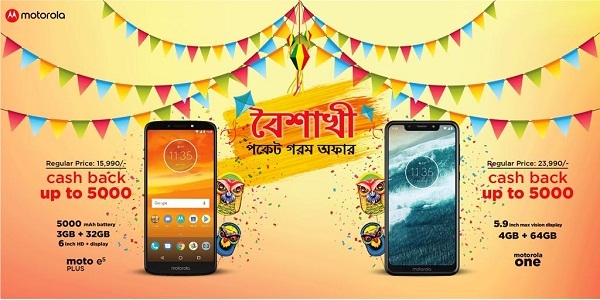 15On the upcoming Bangli New Year Motorola has announced sure cashback offer on selected models of smartphone. Under the ‘Boishakhi Pocket Gorom Offer’ campaign customers will get sure cashback upto 5,000. The models are Motorola One and Moto E5 Plus. This offer will be applicable across the country including Gaget and Gear, Motohub and Edison Smart Plug in center. It comes with QUALCOMM Snapdragon processor and 3GB RAM 32 GB ROM expandable up to 128 GB. Watch up to 18 hours of video and never worry about battery life on those long flights again thanks to the 5000 mAh battery. Bring your videos and photos to life on 6″ Max vision HD+ display. 18:9 aspect ratio with slim profile lets you use the phone comfortably with one hand. 12 MP rear camera with laser auto-focus and PDAF for fast focus and 1.25 Qm pixel size for better pictures in low light. 5 MP selfie camera with LED flash to take great solo or group selfies in any light. The Qualcomm Snapdragon 625 chipset and octacore processor have been used on the phone. 5.9’’ HD+ Max Vision notch Display. From the structural aspects this phone can be the Best Handy or Best Gripple Mobile. Because of using gorilla glass in front and back the phone looks like premium. 4 GB RAM, 64 GB ROM that is Expandable Up to 256 GB. First charging: 3000 mAh Non-Removable battery is used in this phone. Get 6 hours backup by 20 minutes charging and full day backup by full charging of battery. Picture Perfect Camera: 13 + 2 megapixel dual rare camera and 8 megapixel depth sensing selfie camera have been used in this phone. Your each and every moment will be nice with cinemagraphs, spot color effects, blur backgrounds option of this camera. With Google Lans Search you have the freedom to search any object. AndroidOne is used in this phone so that next two updates to Android will be confirmed.